A few years ago, my friend Bethany Price started holding an itinerant writing group in coffee shops in Milwaukee. The group was fun because we wrote, but it was also great because Bethany assembled a different collection of weirdos each time. You always knew you would meet interesting people. A few years later, one of these weirdos, Freddy La Force, decided to quit his day job to publish books and chapbooks. Some of this move had to do, I think, with publishing Return to the Gathering Place of the Waters, a reprise of the landmark 1983 anthology Gathering Place of the Waters: Thirty Milwaukee Poets. 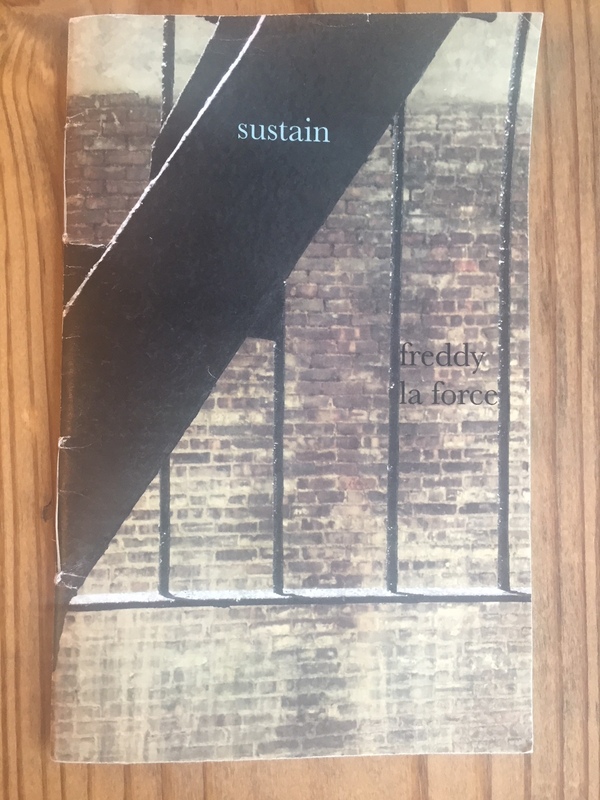 Ever since then, Freddy’s been publishing some very interesting work (including Lindsey Frances Pellino’s Hysterical Sisters, reviewed here). A lot of people are really impressed with his commitment to poetry! Many of us have dreamed about taking a similar plunge. The summer is starting to reach its end for me, but I still have a stack of books on my desk that I haven’t written about yet. Here are three books published by Freddy’s Vegetarian Alcoholic Press. I enjoyed reading them back-to-back. Wikipedia defines the word “nymph” as a “minor female deity.” In Denise Jarrott’s Nymph, we are the nymph, we are the nymph’s beloved, we are given a view into the world of the nymph, the irony of the ethereal confined. One of the most pleasing features of the book is the way that the poems are organized. Some don’t have titles and some micro-series of poems all have the same title (“Cabinet” or poems that start with “Dear _____,”). In the way that the book is a whole poem, with pieces flowing into one another, Nymph reminded me of Dawn Lundy Martin’s Life in a Box Is a Pretty Life. As a 90’s kid, of course I also thought about the movie Thumbelina and the gender politics associated with the handheld woman. Some of the moments in Nymph are very “fairy” moments, and some are a departure. “turn the page,” the beginning of some of Jarrott’s poems implore. I’ve read Nymph twice, and I will likely turn the pages of this mysterious, magical, feminist, experimental book again. Pair this book with: A spring salad, eaten by hand in the garden it was grown in. Then, smoke a cigarette in the garden. he tells me in between puffs on his cigarette. things are still kind of okay, but fifty’s bad, real bad. 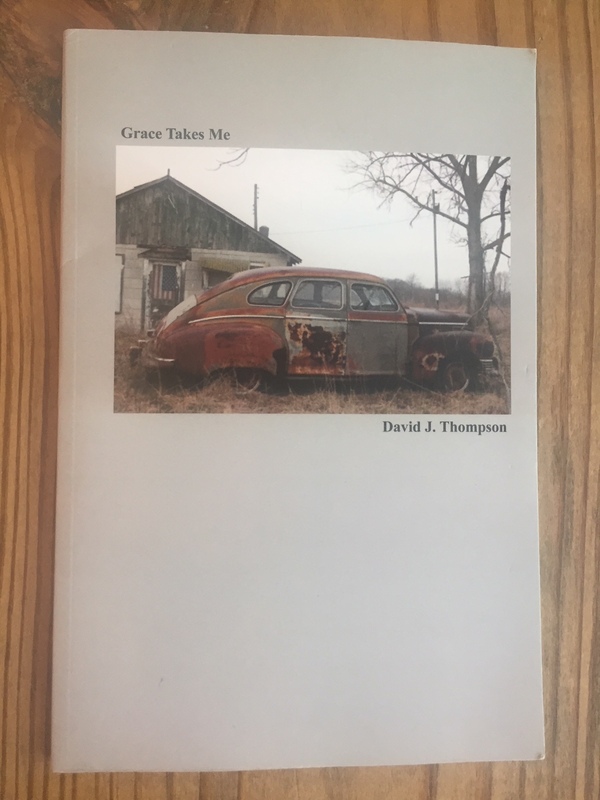 The bar conversation is its own genre, one present throughout Thompson’s Grace Takes Me. The speaker seems to be on a road trip, visiting bars and diners, rest stops and barns. These are narrative poems, moments, but what you’ll probably notice first are Thompson’s striking photographs. A photograph accompanies each poem. I love the texture this presents, and the decidedly Midwestern sensibility of everything in the book. The photographs show us the scenery, the backdrop, and the poems tell the story. Frank O’Hara, Beowulf, and Jesus all make cameos among themes of family history, aging, and love. The speaker and the people in his world are fishing, smoking, drinking vodka, stopping at a red light, unable to sleep through the night in Detroit. Pair this book with: A glass of scotch, served neat, or a Budweiser. It all depends on the night. I was really happy to see that Freddy finally released a chapbook of his own poetry. The work is highly experimental and language-focused. Many of the poems are in the imperative tense, meaning that there isn’t a clearly-defined subject or pronoun. “keep changing hats,” one poem reads. “move to softer faces,/rigid arms” reads another. Line after line of the imperative snowballs and conveys a unique voice, a rhythm. There was something refreshing about reading these highly experimental poems against vast planes of white space. “this moment is tearing,” reads the first line of the last poem. To me as a reader, such experimental poetry tears through the expected and a tenderness emerges. Pair this book with: A vegetarian burrito and a generous side of existential dread. You’ll know when it’s time to order another round. Like what you’re reading? If you have a manuscript you’re trying to get published, VegAl Press is currently accepting unpublished manuscripts of 50 or more pages.